Almighty ever-living God, whose will is to restore all things in your beloved Son, the King of the universe, grant, we pray, that the whole creation, set free from slavery, may render your majesty service and ceaselessly proclaim your praise. Through our Lord Jesus Christ, your Son, who lives and reigns with you in the unity of the Holy Spirit, one God, for ever and ever. The Feast of Christ the King was established by Pope Pius XI in 1925 as an antidote to secularism, a way of life which leaves God out of man's thinking and living and organizes his life as if God did not exist. The feast is intended to proclaim in a striking and effective manner Christ's royalty over individuals, families, society, governments, and nations. 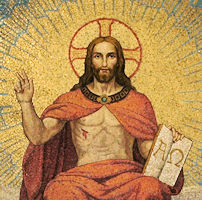 Today's Mass establishes the titles for Christ's royalty over men: 1) Christ is God, the Creator of the universe and hence wields a supreme power over all things; "All things were created by Him"; 2) Christ is our Redeemer, He purchased us by His precious Blood, and made us His property and possession; 3) Christ is Head of the Church, "holding in all things the primacy"; 4) God bestowed upon Christ the nations of the world as His special possession and dominion. According to the 1962 Missal of St. John XXIII the Extraordinary Form of the Roman Rite, this feast is celebrated on the last Sunday of October. The feast of St. Catherine of Alexandria, which is ordinarily celebrated today, is superseded by the Sunday liturgy. With an ever-growing desire, all Advent awaits the "coming King"; in the chants of the breviary we find repeated again and again the two expressions "King" and "is coming." On Christmas the Church would greet, not the Child of Bethlehem, but the Rex Pacificus — "the King of peace gloriously reigning." Within a fortnight, there follows a feast which belongs to the greatest of the feasts of the Church year -- the Epiphany. As in ancient times oriental monarchs visited their principalities (theophany), so the divine King appears in His city, the Church; from its sacred precincts He casts His glance over all the world....On the final feast of the Christmas cycle, the Presentation in the Temple, holy Church meets her royal Bridegroom with virginal love: "Adorn your bridal chamber, O Sion, and receive Christ your King!" The burden of the Christmas cycle may be summed up in these words: Christ the King establishes His Kingdom of light upon earth! If we now consider the Easter cycle, the luster of Christ's royal dignity is indeed somewhat veiled by His sufferings; nevertheless, it is not the suffering Jesus who is present to the eyes of the Church as much as Christ the royal Hero and Warrior who upon the battlefield of Golgotha struggles with the mighty and dies in triumph. Even during Lent and Passiontide the Church acclaims her King. The act of homage on Palm Sunday is intensely stirring; singing psalms in festal procession we accompany our Savior singing: Gloria, laus et honor tibi sit, Rex Christe, "Glory, praise and honor be to Thee, Christ, O King!" It is true that on Good Friday the Church meditates upon the Man of Sorrows in agony upon the Cross, but at the same time, and perhaps more so, she beholds Him as King upon a royal throne. The hymn Vexilla Regis, "The royal banners forward go," is the more perfect expression of the spirit from which the Good Friday liturgy has arisen. Also characteristic is the verse from Psalm 95, Dicite in gentibus quia Dominus regnavit, to which the early Christians always added, a ligno, "Proclaim among the Gentiles: the Lord reigns from upon the tree of the Cross!" During Paschal time the Church is so occupied with her glorified Savior and Conqueror that kingship references become rarer; nevertheless, toward the end of the season we celebrate our King's triumph after completing the work of redemption, His royal enthronement on Ascension Thursday. Neither in the time after Pentecost is the picture of Christ as King wholly absent from the liturgy. Corpus Christi is a royal festival: "Christ the King who rules the nations, come, let us adore" (Invit.). In the Greek Church the feast of the Transfiguration is the principal solemnity in honor of Christ's kingship, Summum Regem gloriae Christum adoremus (Invit.). Finally at the sunset of the ecclesiastical year, the Church awaits with burning desire the return of the King of Majesty. We will overlook further considerations in favor of a glance at the daily Offices. How often do we not begin Matins with an act of royal homage: "The King of apostles, of martyrs, of confessors, of virgins — come, let us adore" (Invit.). Lauds is often introduced with Dominus regnavit, "The Lord is King". Christ as King is also a first consideration at the threshold of each day; for morning after morning we renew our oath of fidelity at Prime: "To the King of ages be honor and glory." Every oration is concluded through our Mediator Christ Jesus "who lives and reigns forever." Yes, age-old liturgy beholds Christ reigning as King in His basilica (etym. : "the king's house"), upon the altar as His throne. A procession for Christ the King on this feastday, either in the Church or at home is appropriate for this feast. The Blessed Sacrament would be carried and the procession would end with a prayer of consecration to Christ the King and Benediction. Try to participate if your parish has a Christ the King procession. If not, try having one at home (minus the Blessed Sacrament). Read Pope Pius XI's encyclical Quas primas (On the Feast of Christ the King) which shows that secularism is the direct denial of Christ's Kingship. Learn more about secularism - read the Annual Statement of the Bishops of the United States released on November 14, 1947. Being a relatively newer feast on the Liturgical calendar, there are no traditional foods for this day. Suggested ideas: a wonderful family Sunday dinner, and bake an cake shaped as a crown or King Cake or a bread in shape of a crown in honor of Christ the King. A partial indulgence is granted to the faithful, who piously recite the Act of Dedication of the Human Race to Jesus Christ King. A plenary indulgence is granted, if it is recite publicly on the feast of our Lord Jesus Christ King. ". . .Then will appear the sign of the Son of Man, He will send forth His angels with a trumpet. They will gather His elect from the four winds" (Gospel). The world coming to its end! Such an announcement would make "all tribes of the earth mourn," especially him who clings to earthly things and now realizes he must "not turn back to take his cloak." Let us be realists: the world will dissolve, disappear in ruin! The liturgical year comes to an end today. It is the symbol of the final assumption of Jesus' Mystical Body into heaven, the last act in an eternal drama. May we flee from the "false christs" who "lead astray. . .even the elect" (Gospel), enslaving, misleading, corrupting their minds, by the press, over the television and the movie screen.